Go to http://magistrate-efiling.co.henry.ga.us/Public/Menu.aspx to add to a Trusted Site. Press ALT+D to select the Web address, and press CTRL+C to copy it to the Windows Clipboard. This saves you from having to type it later. 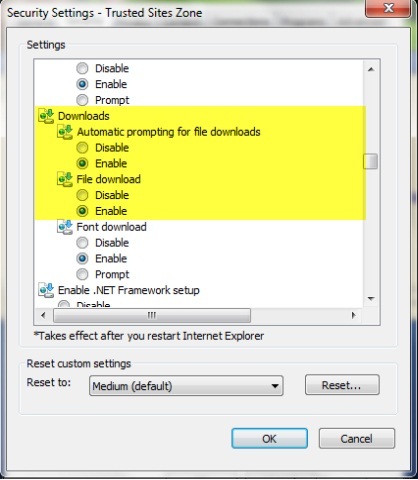 On the Internet Explorer 8 Tools menu, click Internet Options. 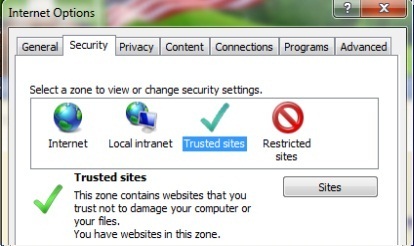 Click the Security tab, and then click the security zone and select Trusted sites. Click the Sites button. See step 5 in the image below. In the Add this Web site to the zone box, press CTRL+V to paste in the Web address. See step 6 in the image below. Note: If Internet Explorer 8 asks for confirmation, you may be trying to add a site that is not secure. Internet Explorer 8 will accept only sites to the Trusted list that make a secure connection—for example, secure banking or shopping sites. To identify such a site, look for https:// in the Web address. To add an unsecured Web site (http://magistrate-efiling.co.henry.ga.us), click to remove the check in the Require server verification box. If you want to add more sites to this zone now, you can go back to step 6 and type any additional Web addresses into the Add this Web site to the zone box, and then click the Add button. Change the Trusted Site security level by clicking the Custom Level button. 10. Set the Automatic prompting for file downloads setting to Enabled. This item can be found under the Downloads section. 11. Click OK button twice.